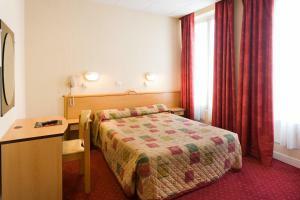 Hotel Helvetia is located in central Paris, a 2 minute walk from the Gare de Lyon Metro and train station. It offers en suite accommodation with free Wi-Fi internet access. Guest rooms at Hotel Helvetia are equipped with a TV and an en suite bathroom with either bath or shower. All rooms are serviced by an elevator. A continental breakfast is served daily at the Helvetia. Guests can enjoy breakfast served in their room upon request. The hotel also provides a 24-hour reception service. The Helvetia Hotel is just 10 minute walk from the historic Place de la Bastille and the Jardins des Plantes. Le Louvre Museum and the Champs-Elysees are a short direct metro ride from the hotel. A bus service departing from the Gare de Lyon provides a direct link with Roissy Charles de Gaulle and Orly Airports. Please note that all children over 2 years old are charged as adults. Free Wi-Fi access, a TV and a private bathroom feature in this room. Rate: € 60.00 ... € 114.00; select dates below to get current rates.